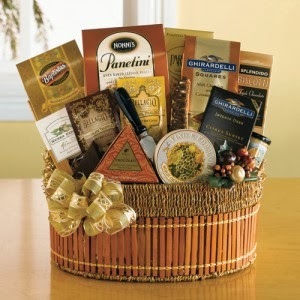 This amazing Golden Delights Gift Basket is just one of the many baskets available from California Delicious. This gift sets the gold standard that other companies have yet to meet. A beautifully woven basket is filled to the brim with treats, cheese straws, biscotti, Ghirardelli milk and caramel squares, chocolate truffle hot cocoa mix, cheese, flatbread crisps, chocolate truffles, chocolate chip cookies, nuts, amaretto cookies, butter toffee pretzels, French chocolate truffles, Monterey jack cheese, a wood handled cheese knife, and chocolate crackle cookies. This gift basket is one of the best I have ever received. Filled with so many tasty and delightful things, I was most impressed with the cheese flavors and variety. You can't go wrong with a gift basket from California Delicious no matter what the occasion. California Delicious has offered one of my readers a $50 GC to purchase your own gift basket for keeping or giving. You must be 18+ and have a US shipping address. This gift sets the gold standard. A beautifully woven basket is filled to the brim with a bevy of treats, cheese straws, biscotti, Ghirardelli milk and caramel squares, chocolate truffle hot cocoa mix, cheese, flatbread crisps, chocolate truffles, chocolate chip cookies, nuts, Amaretti cookies, butter toffee pretzels, French chocolate truffles, Monterey jack cheese, a wood handled cheese knife, and chocolate crackle cookies.